Hi beautiful! I have to show you this new jacket I got from Zara today. I saw this and literally said "YOU are coming home with me!" :) it was love! 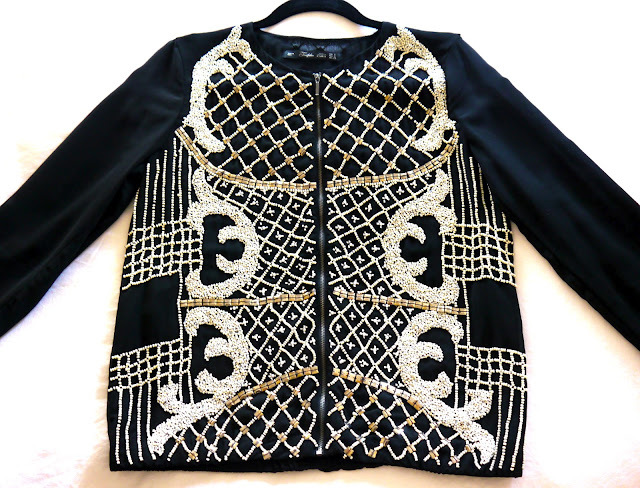 I had to do a bit of inspecting on all the jackets since there are hundreds of beads sown on to this, and a few were loose and/or off on some of the jackets. So I got a fresh new one from the back and it is perfect ♥ Zara has done it again and created something so expensive looking for a great price - this could easily look like I just dropped $800 at Barneys! I would wear this with black jeans, super high leather booties and my Chanel bag. It is definitely a statement piece and I can't wait to rock it! Would you wear a fun crazy jacket like this? Here it is on the Zara website! Oh, this jacket will look amazing on you! Can't wait to see you wearing it!! The bead-work is amazing! Super gorgeous. That is such a gorgeous jacket! So classy and beautiful!!! Ahh I love that jacket! I can't wait to see you in it! I love your blog soo soo much! I just started a blog today and was hoping you could stop by follow possibly if you like it (no obligation of course). :). Thanks! Waaaw! Can t wait to see how you style this baby! Dragut!Imi place geaca e super tare!Poti sa mai faci niste tutoriale cu machiaj?Pupici Annie! FLAWLESS. I totally want it. I was just searching up bomber jackets for this spring 2013 and landed on this post that you published a long time ago. I'm very glad to find your blog Annie! You've got great taste.